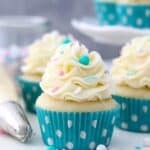 This is a homemade Moist Vanilla Cupcake recipe using oil instead of butter to produce a dense and sponge-like cupcake. The results are perfect cupcakes every time! 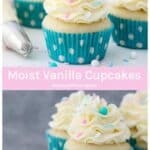 This is a quick and easy vanilla cupcake recipe that is also versatile and can be adapted to other flavors. I think everyone needs a quick and easy cupcake recipe that they can make in a pinch. This, my friends, will become your go-to cupcake recipe. 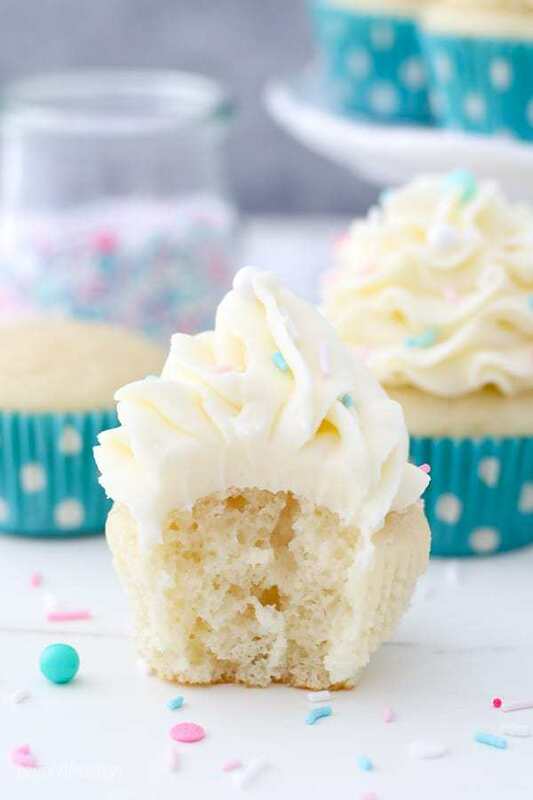 These Moist Vanilla Cupcakes are dense like a sponge cake, stays moist for days and are packed with vanilla flavor. These are topped with a whipped vanilla frosting. This is my idea of a perfect cupcake. 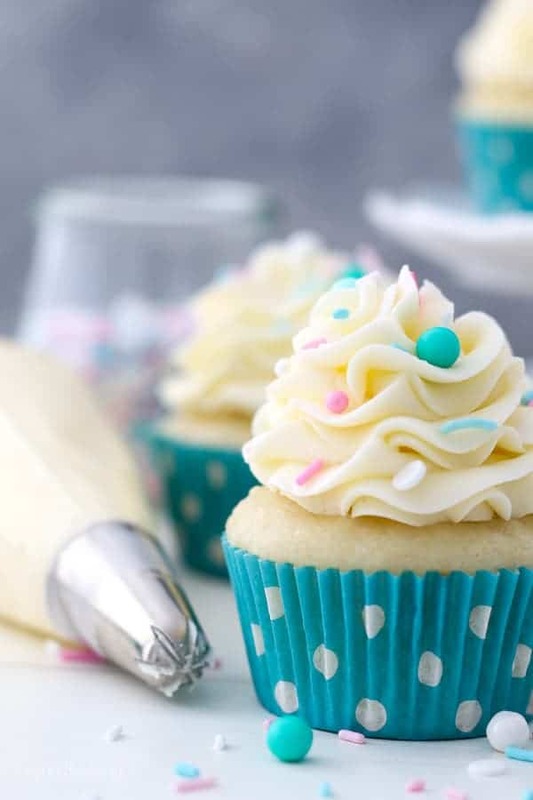 When I say this recipe is quick and easy, it’s because this cupcake recipe uses vegetable oil instead of butter, so you do not need to wait for any butter to come to room temperature. You can literally come home from work and have cupcakes in the oven 10 minutes later. Chances are, you can prepare this recipe faster than your oven can preheat. Let’s discuss some of the components of this recipe. One of the reasons I like vegetable oil is because oil tends to make cakes more moist than a recipe with butter. It also makes the crumb and texture a bit more tender and tighter. 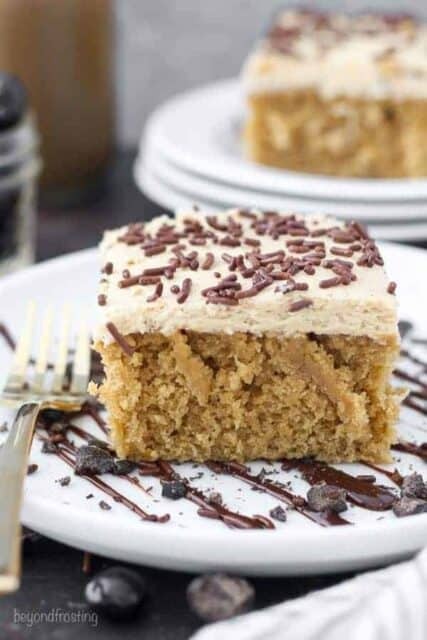 Be sure you get a high-quality REAL vanilla extract for this recipe because the vanilla is your main ingredient for flavor. You could even use vanilla bean paste if you prefer. This recipe calls for light sour cream. I get a lot of questions about substitutions for the sour cream, and I recommend substituting with Greek yogurt. Personally, I find that the sour cream is essential for keeping the cupcakes moist after the first day. So, I do not recommend omitting it all together. This vanilla cupcake recipe is very adaptable. 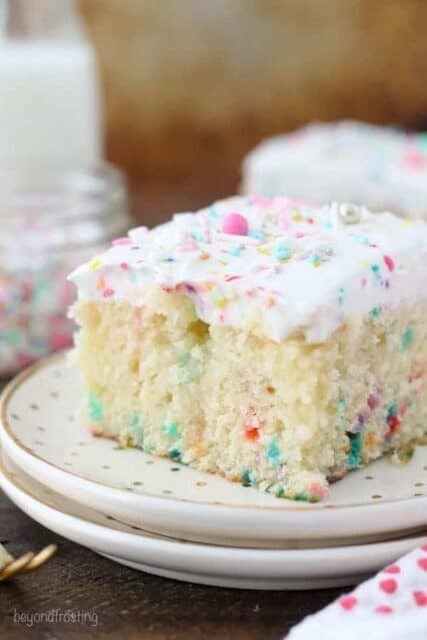 I’ve made this recipe into funfetti, Oreo cupcakes, even lemon cupcakes or margarita. Best of all, it can be made in a 9×13 inch pan as a vanilla cake. The vanilla cake has rave reviews. Let’s talk real quick about the perfect vanilla frosting. This is my go-to frosting recipe because my recipe uses COLD butter. That’s right, there’s also no waiting for the butter to come to room temperature for this recipe either. However, this does mean that it takes a bit more time to beat the butter. My secrets for the perfect frosting are to whip the butter in the beginning for several minutes, and then again at the end, which makes it light, airy and very pipeable. I also use heavy whipping cream which helps reduce the sweetness because there’s quite a bit of powdered sugar in this recipe. 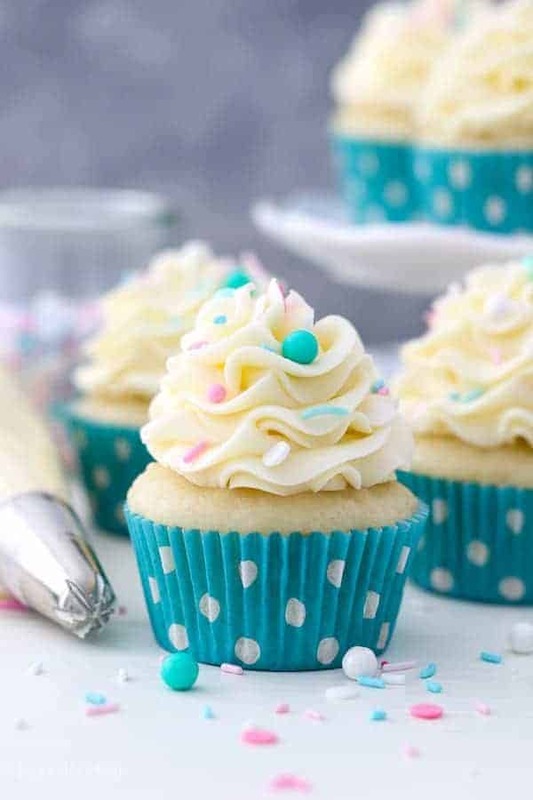 Again, you can flavor the frosting with your favorite extracts such an almond, lemon or even peppermint. A little lemon or lime zest also does wonders. The best way to make the cupcakes is to use a large cookie scoop to ensure the batter is evenly divided between each liner. This batter is on the thinner side, so the cookie scoop works perfectly. I’ve shared plenty of tips for baking cupcakes, but using a cookie scoop is by far the best way to get consistent results. Every cupcake pan cooks cupcakes differently. I have several of the Wilton Recipe Right cupcake pans which are a light color aluminum nonstick cupcake pan. These are great, inexpensive cupcake pans. For the best results you should store the finished cupcakes in an airtight container. I get a lot of questions about my cupcake liners because they are so bright after baking. I special order the liners from Shop Sweets & Treats. They make grease-proof cupcake liners, which means that no matter what color your batter is, they stay nice and bright after baking. The paper quality is very thick, which is great. I will say though that sometimes, the cupcake liners start separating from the sides of the cupcake because the cupcake is so moist. I hope you enjoy these Moist Vanilla Cupcakes as much as I do. And if you have any questions or feedback, be sure to let me know by leaving a comment below. Happy baking! 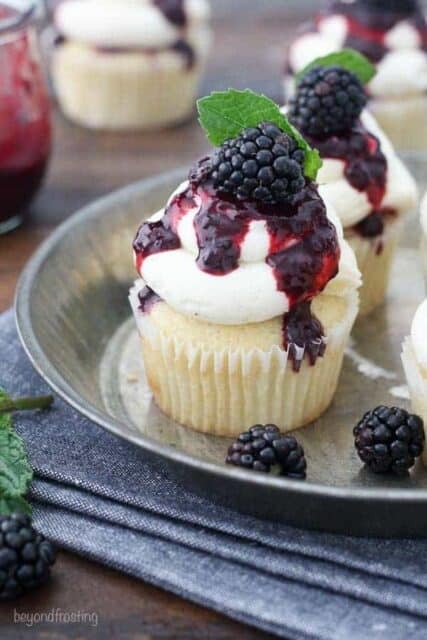 How can I make my cupcakes moist? I find the simplest way to by adding sour cream or Greek yogurt. That is why you’ll find that my cake and cupcake recipes usually contain this ingredient. Also taking care not to over mix your batter and over bake your cupcakes will help prevent them from drying out. I also suggest storing them in an airtight container to maintain the moisture. How do you know when my cupcakes are ready? I usually set my timer for the minimum baking time and then I check on them every 30-60 seconds after that. I press down the top of the cupcakes and they should spring back up. I also always use the toothpick test. I poke the top of the cupcakes with a toothpick and if the toothpick comes out clean, your cupcakes are done. Do I have to use Sour Cream cream? As I mentioned above, sour cream helps keeps these cupcakes very moist. I recommend substituting the sour cream with non-fat Greek Yogurt if you do not have sour cream. Can I make this as a layer Cake? 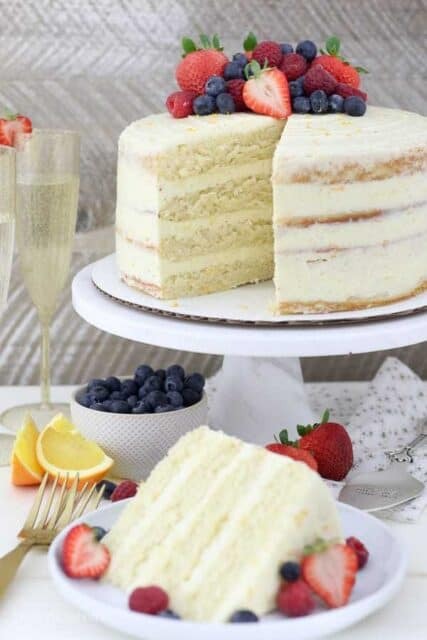 Yes, you can, here is my recipe for the Moist Vanilla Layer Cake. Do I need to refrigerate my cupcakes? 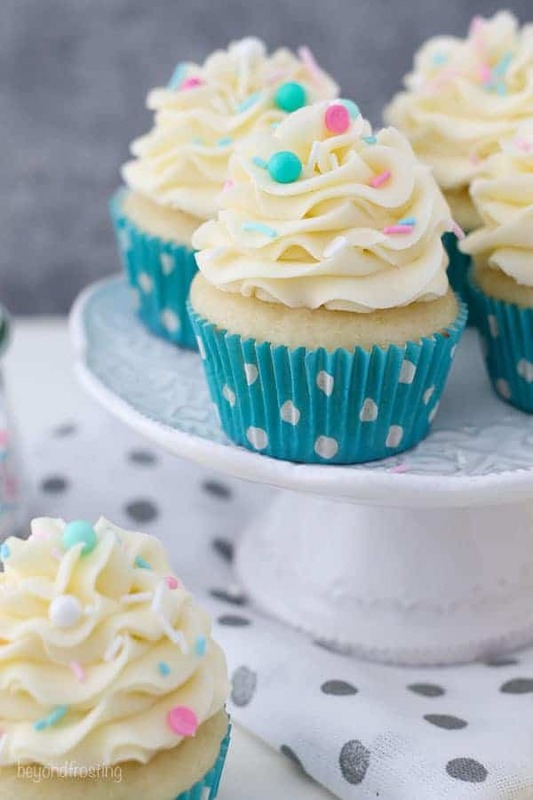 If you live in a hot and humid environment then I would suggest that you refrigerate cupcakes that are frosted and allow them to come to room temperature before serving. Since this frosting is all butter based, it will melt in high temperatures or in humid environments. If you are serving this buttercream at an outdoor party, be sure to keep it out of the sun, especially if temperatures are hot that day. Otherwise I store my cupcakes in a cool, dry place in an airtight container for up to 3 days once they are frosted. If I could give an extra half star I would, it’s a decent recipe, super fast, and produces a nice white cake. The crumb is good, fairly moist, not the lightest most airiest cake I’ve ever had. It had a prominent eggy flavor and lacked depth, like it could’ve used more vanilla? I’m not sure what it was, it was a little plain, but everyone I served it to loved it. Thanks for this recipe! Hi Lu! You are correct, this is definitely not a light and fluffy cupcake. Sounds like it was a success for you! Thanks for sharing. Love the cupcakes! I’m experimenting with flavors and finding many add ins are sinking (choc chips/ blueberries) Any tips? So far the only solution is to add this halfway through the bake. Hi Lauren, are you tossing them in flour before you use them? This is a pretty thin batter, but blueberries tossed in flour seems to work okay. Just wondering if you can you use Coconut Oil instead of Vegetable Oil? Hi Renee, I have not tested it with coconut oil but if its a 1:1 substitution, I think it should be ok. Enjoy!